A test which allows growers to assess soil nitrate levels in the field in a matter of minutes can help to reduce the risk of nitrogen over application and leaching. Plant and Food scientist Matthew Norris said the technology, which has been available overseas for several years, was “rapid, cheap and very simple to use”. Managing the nitrogen (N) supply to the crop has become increasingly important for growers, with many regional councils placing limits on nitrogen losses from a farm. The aim was to develop a simple and adoptable quick test mass balance tool that assisted growers through the decision making process of whether to apply nitrogen to crops, whether at sowing, crop emergence or during the growing season. For the budget to be developed, estimates are required for how much N the crop will need and how much N will be supplied by the soil. Soil sampling and subsequent testing is required to quantify soil N supply. The two standard tests available to growers are the mineral N test which gives an estimate of how much N is immediately available and the AMN test which estimates the potential for N to become available as organic N is mineralised. 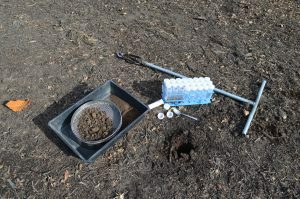 As soil testing can be time consuming and results are not immediately available, quick, cheap methods for estimating soil N levels throughout the season are useful. The quick test mass balance approach is currently being developed and validated as part of a three-year SFF project (‘Nitrogen – Measure it and Manage it) managed by the Foundation for Arable Research and supported by industry. This has included trials of the test’s use in potato, maize and leafy green crops. In a Canterbury trial, standard grower practice was compared with the N quick test tool to achieve a yield of 58 tonnes/ha of potatoes. By using the quick test tool 90kg less of N/ha was applied on the potato crop, with no loss of yield. 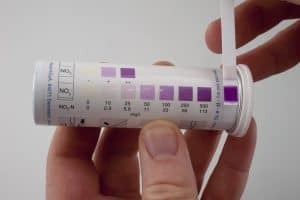 The quick N test strips are similar to the litmus strips used for soil pH testing, but are coated with a chemical which is sensitive to nitrate. The process involves mixing a 10ml sample of soil with 30ml of calcium chloride solution and leaving it to stand for 30 minutes. A “test strip” is then dipped into the solution and left for one minute to develop in colour. 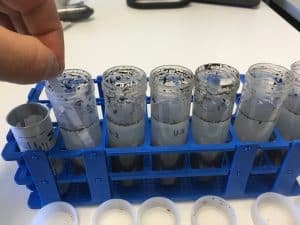 “The colour can be read against a scale and a correction factor used to convert the value to a field basis (kg N/ha) by taking into account soil texture and moisture status.” Because nitrate is the predominant form of mineral N is most cropping soils, quick test nitrate is a useful proxy for mineral N supply. In the field, farmers or growers would be able to take a series of samples, and as long as the sediment was well-settled after mixing – usually after about 30 minutes – they would have an “on the spot” indication of their paddock’s plant-available nitrate status. The resultant value can be compared against critical threshold values which indicate whether an N fertiliser application is needed or not, Matthew Norris said. In an experiment, the quick N test was used to manage N applications on potato crops at sites near Opiki, Matamata and two near Timaru. At all of the sites, fertiliser applied at planting was incorporated while fertiliser applied as side dressing was broadcast. Potential yield and crop N uptake values were estimated with the Potato Calculator tool. The experiment compared the grower’s planned amount of N, to be applied at planting and side dressing, with a Quick Test Mass Balance (QTMB) treatment. At harvest, plant population, total tuber number and total tuber fresh weight were measured. The experiment showed that potatoes were grown with less nitrogen and with no loss of yield, using the QTMB treatment. Fertiliser savings ranged from 25 to 55 per cent across three trial sites. At the fourth site, the QTMB approach confirmed that the grower’s fertiliser plan was correct.